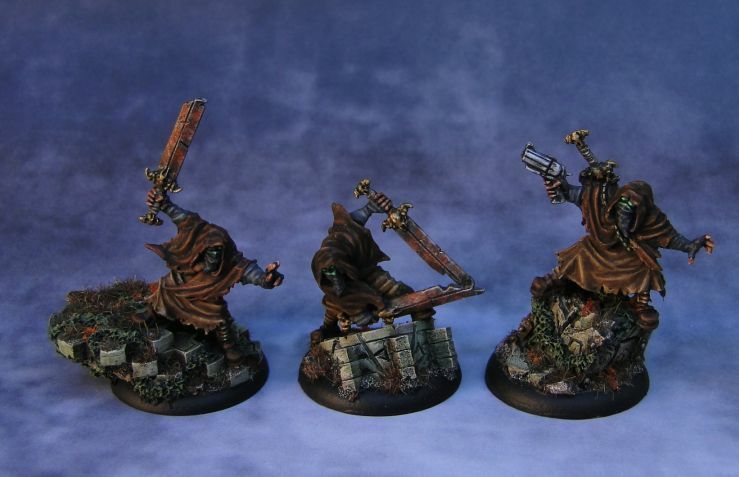 These minis have always been among my favorites from Malifaux range The sculpts are dynamic and the level of detail is excellent. What's more, they have nice fluff. Basically they're ex-mages that worked for Arcanists but were captured and brainwashed by the Guild. Now they're used to fight against their former employees. In game they function as debuffers and pretty solid (magical weapon) fighters. 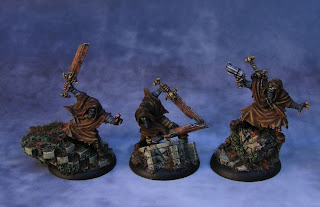 I spent a few evenings painting them and paid a lot of attention to saturating their robes. I used several glazes of blue and brown to give them a nice, deep hue.The washes from Vallejo worked really well with brown here. I was pretty pleased with the effect. Unfortunately, after spraying them with an anti-shine varnish from Army Painter, they were...glossy. So I went over them with an anti shine medium from Reaper. And that was my mistake. An ugly looking whitish residue formed on the minis. I removed some of it before it dried completely but some stayed there. 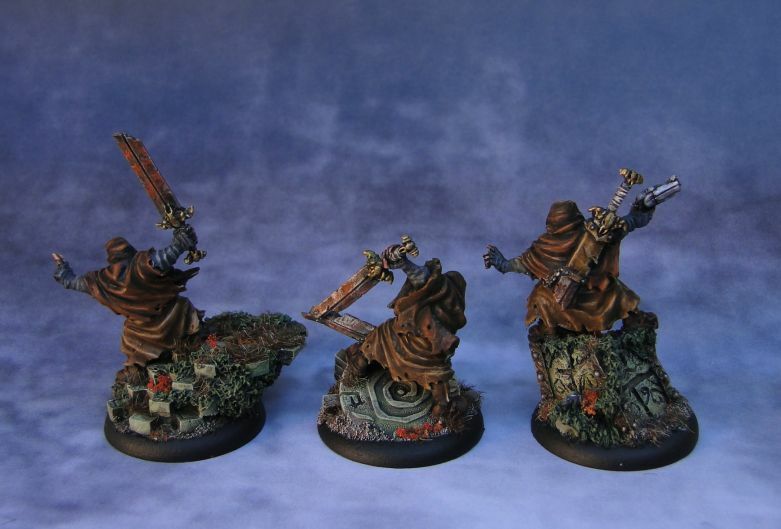 Rather than stripping the mins off paint, I tried to save the minis by going over that with washes one more time. It improved the look but still, a very decent paintjob turned into a run-of-the-mill one. Not so run-of-the-mill, still look great from here! I had frosting issues a few times with GW Purity Seal, that was very upsetting, I feel your pain.